People of India - Top Travel & Tours Pvt. Ltd. In a diverse and elaborate country like India, it is evident to find that people here bring forth the rich glories of the past, the culture, traditions and values relative to geographic locations and many distinctive behaviours, habits and food. Since time immemorial, India has been invaded by armies, traders and immigrants who brought with them their own style, beliefs, practices and observances which have all added to the glorious texture of Indian life and living. From the boundless snows of the Himalayas to the cultivated peninsula of far South, from the deserts of the West to the humid deltas of the East, from the dry heat and cold of the Central Plateau to the cool forest foothills, Indian lifestyles definitely glorify the geography. The food, clothing and habits of the Indians are according to the place of their origin. Indian families have deep-rooted values which are given importance and recognition. 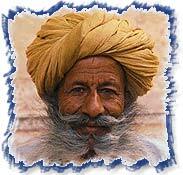 The surname of an Indian is grounded on his caste or place of origin or his family occupation. Men are no longer single breadwinners of the family but are still considered to be the head and are consulted for all decisions. A wife will always serve her husband before she eats, parents are looked upon with respect and regard and children are financially supported by their parents throughout their education. Becoming a part in times of joy and sorrow is the prime belief of the Indians where they share all the happiness and sorrow. A festival is never bounded to a family or a home but the whole community or neighborhood gets involved in adding liveliness to an occasion. The festivals like Diwali, Holi, Id, Christmas, Mahaveer Jayanthi are all jubilated by sharing sweets and pleasantries with family, neighbours and friends. Indian weddings are celebrated with great enthusiasm where all the family members and friends are invited. Likewise, neighbours and friends always help out a family in difficult times. Indians speak various languages, follow different religions, enjoy different cuisines but still stand together as a unified nation. The country has a rich arts and culture which is unmatched anywhere else in the world. The charm of Indians lies is in the spirit of tolerance, sharing and an amalgamation of cultures that can be matched to a garden of flowers of different hues and shades which, bloom together to glorify the garden itself. Religion : 80% Hindu, 14% Muslim, 2.4% Christian, 2% Sikh, 0.7% Buddhist, 0.5% Jains, 0.4% other.